As you might have been able to tell, (due to me actually writing some articles,) I’ve had a bit of time on my hands recently. It’s allowed me the time to catch up with loads of the RPG systems on my to-do list which have included Sins and FAITH. One other on my to-read list was a quick start guide of an RPG published by Burning Games, the same publisher as FAITH. Again this particular PDF was given to us by Burning Games but was available via DriveThruRPG as part of their Kickstarter. Sadly we missed their actual Kickstarter launch but we are happy to say that it was successful at being funded and you can late pledge if this is something that you’re interested in. This overview is based on this preview version of the game and so the final version is obviously subject to change. 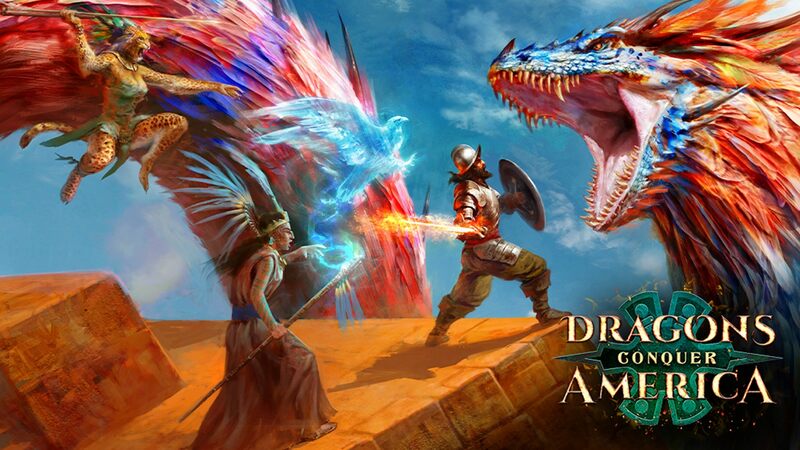 Dragons Conquer America (DCA) originates from a place of history, and is set in Meso-America, around the 1500’s. Although its origins is based in history, it does include fantasy elements. The explorer Christopher Columbus died years ago, after discovering the West Indies, or what most people then called the “New World”. The first settlers came to the “New World” armed with guns, whilst dragons conquered the easternmost islands. They lived with knowledge that there was a larger continent to the West and although their coasts had been sailed no major mainland exploration has overcome the war like tribes. It has the same system to FAITH, in that it uses a standard set of poker cards to resolve actions. However, instead of requiring all 52 you only need numbers 1 (Ace) to 6 and one Joker. You can also use dice to play. If you’re using dice it is recommended that you have a pool of 25 D6 dice, consisting of four main colours (6 in each colour to represent the suits and one for the joker) per 3 players at the table. It’s advisable that dice be the same size, weight and feel because they will be drawn blind from a bag to simulate a hand of cards. The game also contains a source of magic that revolves around religion, this is called Spirit. Players use Spirit to cast spells in aid to help dispatch their foes. To gain Spirit you must perform rituals and during these rituals you may choose to try and “transcend” which can then add to or remove spirit based on the success or failure of a check. Players keep a total of what spirit points they think they have and the GM keeps a true total, being the only person who knows the outcome of the transcendence check. The Rituals are aimed to work with all types of religion depending on the character. Some of the Rituals are on the passive path of praying all day, resisting temptation for the vows you have take, and endurance where you have forgone the comfort of food, water or rest to the more violent blood letting (cutting ones self), sacrifice and of course fighting and killing heretics. This sounds all like some excellent Role Play opportunities to me. Since Spirit is an indeterminate resource the player can overspend on it and cause themselves to suffer some “Corruption” and only the GM knows just how much corruption a player has. A player can suspect if they have corruption but will never know for sure; they can undo the corruption but as far as I could see this is not detailed in the starter book. Corruption takes the form of curses which the GM should use against the player and their team based upon the players religion. The starter scenario introduces the players to the existence of a gigantic precious stone, which is actually the egg of a dragon. However, it lies in a dangerous trap filled temple in the lands of an isolated tribe. A Spanish expedition has also heard about this treasure and on their way to recover it. The players must race against time, avoid all the traps and beat a Spanish force to get to the prize. It’s split down into three main chapters. The first chapter has the players arriving and meeting the Atlaca tribe, the guardians of the temple. The second chapter aims to see the players enter the temple and facing an ancient spirit that protects the egg. The final chapter sees the arrival of the Spanish and finally will determine if the players will keep the egg or not. 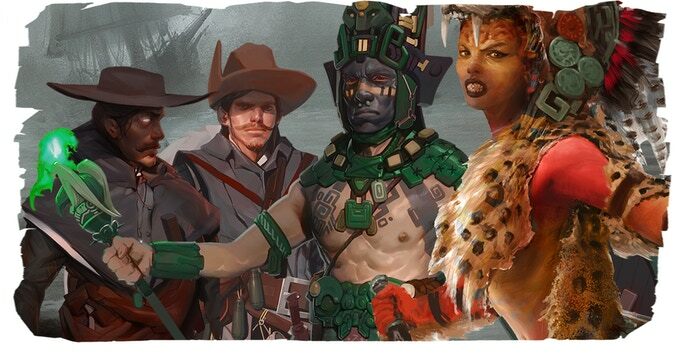 The players play take on the roles of some mercenaries that have no allegiance to the Spanish or native tribe. This will have to be worked out during the adventure as to which side they choose to lean. I don’t feel that I can pass a final verdict on a beta version of an RPG. I will say that the idea behind how Spirit works and the possibility of the consequences that might happen due to the curses make the evil GM in me rub my hands with glee. The amount of good RP that could come from that opens a world of great characters to play with. I’m equally excited to see as a player what afflictions I acquire by using too much Spirit, how that affects my party and how I feel about it. If you really need a verdict on this, my personal verdict is count me interested. I think the scenario that comes with this beta gives you a great sense of what the game has the capacity to deliver. It’s all going to depend on the GM and the party because stories are only as good as the people creating them. What do you think of the Spirit system in Dragons Conquer America? There is load more videos on the Burning Games YouTube channel. Would you like to see what the the final product has to offer? Have a look at the Kickstarter to late pledge or keep an eye on the social media for Burning Games. Give your feedback on this article via the comments section or over on Twitter and Facebook. Often underrepresented, but never underappreciated – The women of anime, comics, film and video games are here. Who is our top woman in all media? Who has the strength, the resolve, the skill and the brains? We were surprised we hadn’t made a Top 10 Female Protagonists list before, so we figured we’d right that wrong, as we check out our favourite women in all different media.